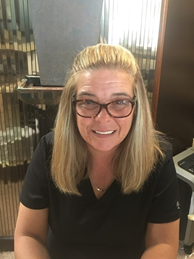 Ginger started working in dentistry 2004, the year she received certification at the Academy of Dental Assisting in Lexington, KY. She received coronal polishing in 2006. Since 2014 Ginger has been working with Dr. Emrich that she finds rewarding. To be able to see a change in a person’s life by helping them with their smile and knowing Dr. Emrich takes the time to get to know his patients, is caring and honest, are her reasons she loves what she does. Pam is a certified Expanded-Duty Dental Assistant from Medquest College in Lexington, KY and completed her internship under Dr. Emrich. Also certified in nursing, dentistry gives Pam a new challenge that allows her to learn and grow while helping other people.